Kiosk Commander Software from CyberPower keeps kiosks and other unattended systems operating by power cycling (restarting) the attached computer when it locks up or performs poorly. This software application is ideal for computers that run kiosks, security systems, ATMs, video lottery machines, and other remote systems. It maintains efficient operation which is important to profitability and safety and reduces the need for assistance from technical support representatives. 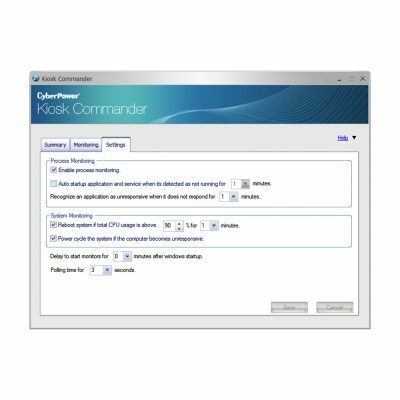 Kiosk Commander operates with a CyberPower UPS and PowerPanel® Personal Edition software to monitor unattended systems and triggers a power cycle from the UPS when necessary to restart the attached system. Together, they provide services for unattended systems and ensure that your equipment is protected from power events, including blackouts, brownouts, surges, and other power occurrences. 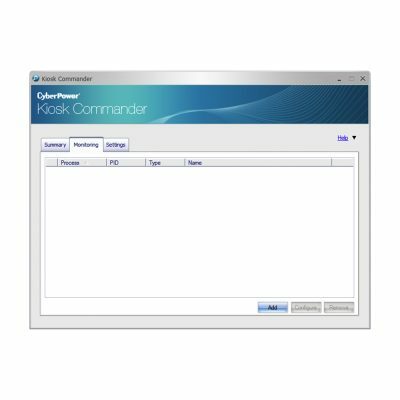 Features of Kiosk Commander include unattended system monitoring, auto restart of unattended systems, a setup wizard, CPU and memory monitoring, configurable settings, and system summary information. The CD package includes Kiosk Commander Software with PowerPanel Personal Edition UPS monitoring Software and the quick installation guide. Kiosk Commander monitors unattended devices to ensure they operate continuously and don’t experience down time due to a lock-up or substandard performance. If the unattended system experiences a lock-up or poor performance, Kiosk Commander will initiate a power cycle with the UPS to restart the system and ensure maximum up time. 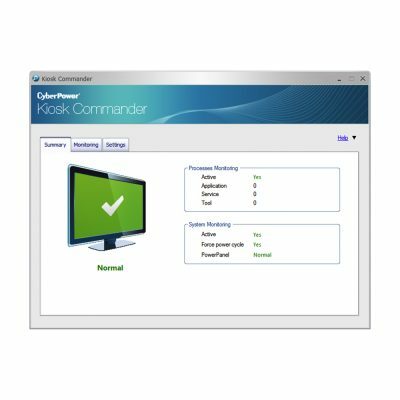 Kiosk Commander, CyberPower UPS, and PowerPanel Personal Edition provide a complete protection plan against power events and system lock-ups. The Quick Guide PDF offers installation instructions, tips, captioned screen captures, and information about hardware requirements and operating systems. A setup wizard assists in adding desired services and applications used for monitoring system operation. Automatic setup process helps to configure the thresholds for CPU and Memory on select services and applications. The configuration setting can be imported and exported to make mass deployments more efficient. 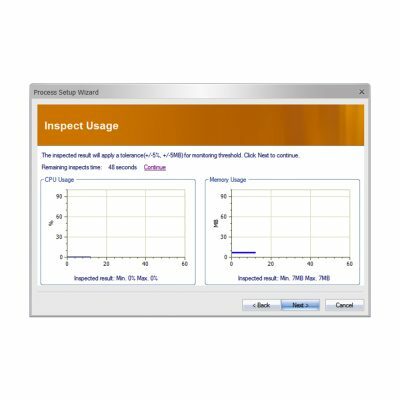 The easy-to-use interface provides a summary of performance. Compatible with Windows 10, Windows 8, Windows 7, Windows Vista, Windows XP, and Windows Server 2008. Should I register the CyberPower product I purchased? We recommend that you promptly register the product you purchased. You may register online by clicking the Registration button at the top of the page.